Located at Castle Donington in North West Leicestershire, East Midlands Airport mainly services the counties of Derbyshire, Nottinghamshire, Leicestershire, Staffordshire and South Yorkshire. The Airport was originally an RAF Station that was decommissioned in 1946, but after being bought in 1964 it opened for passengers the following year. The Kildare Hotel and Golf Club is a golf and leisure complex located in Straffan, County Kildare. It is built on the old grounds of the Straffan Estate and was established in 1991. The club has two golf courses both designed by Arnold Palmer one of which was the venue for the 2006 Ryder Cup. The NIA is one of the busiest large-scale indoor sporting and entertainment venues in Europe, with over 4 million visitors having passed through its doors since opening in 1991. The arena can seat up to 14,500 people, but flexible seating allows the layout to be adapted. Four car parks are also located within the NIA. The research and assessment centre in Nijmegen houses high-grade technology as well as a high grade fire alarm system. To create a ‘super safe building’ ETB Lubbers chose a fire alarm installation utilising the advanced penta range of products installed by local partners Hertek. Advanced has supplied a range of intelligent solutions for an upgrade to the fire and safety systems at Rio Tinto Alcan’s Lochaber aluminium smelting plant in Fort William, Scotland. System integrator Argyll & Highland Fire Services designed and installed the upgrade using Advanced’s fire detection and emergency lighting control panels and LifeLine DDA-compliant alarm systems for the hearing impaired. Fratton Park has been the home of Portsmouth FC since its construction in 1898. The stadium is all-seater and has a capacity of 21,100. The main stand was designed by Archibald Leitch, a legend of stadium design, and the first match was a friendly against local rivals Southampton which Portsmouth won 2-0. Claridge's is one of the most famous hotels in the world. 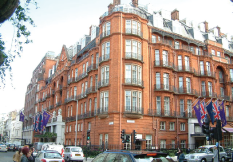 The 5-star hotel in Mayfair, London has long-standing connections with royalty that have led to it sometimes being referred to as an "annexe to Buckingham Palace". As well as Queen Victoria, Claridge's boasts an impressive list of former and current guests including Audrey Hepburn, Alfred Hitchcock, Brad Pitt and Joan Collins. The flagship boutique is located at 18 Sloane Street and was first opened in 1990, renovated in 2009 by Frida Giannini’s new design the store covers 20,00 square feet on two levels and has an impressive 60 meter façade looking out on to Sloane Street.